Today’s post is a little different, since it does not cover a team or a certain issue in sports. It is instead a post about what COULD happen. I know, why talk about something that isn’t set in stone? Well, this is a place that I fondly remember. In case you haven’t heard, the Cincinnati Mall (yes, that is what it’s called) might be the home of a new ice rink, suitable for high school, youth, and adult league teams. Read the story here. Currently, the mall is empty. 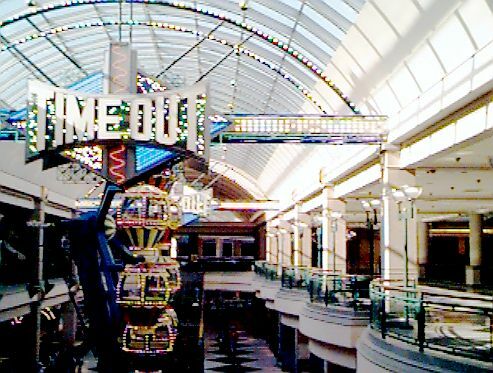 If you’ve been in the mall, you know it feels like a blank, dark museum rather than a place to buy goods. It’s so bad, that there’s one entire wing closed to the public and without electricity. The point is, this is a big thing that could happen for the empty mall. It’s certainly big enough to hold a rink, and it would help serve a purpose to the giant structure. It could also help spread hockey to the area. One area being considered for the ice is the old Bigg’s store (yes, Forest Fair had a grocery store until 2008.) If that doesn’t work, there’s talks of adding a water park in the former hypermarket. The measurements of the old store is roughly 250,000 square feet, according to the article from the Business Courier. Another goal is to have Candlewood Suites take over the old Steve and Barry’s space, which once was an Elder-Beerman. It would be nice to have something in the mall that deals with sports and get hockey in the area. It would help bring traffic into the mall and hopefully help spread hockey programs around the area. According to the article, it could be a while until we see the rink (about three years.) We can hope that it does go through. Source of information from the Business Courier of Cincinnati. Picture from city-data.com. By theleewmowen in General Sports on April 24, 2011 .